It is without saying that nowadays, content marketing is for almost every marketer a powerful weapon in his/her hands. It has become a universal tactic, with almost 88% of companies using it in 2017. However, do you know how to use it effectively in order to achieve the one ultimate goal: CONVERSIONS? You are not sure about your efforts or you need something that can really make the difference? Don’t worry… Below we are listing only for you 14 proven content marketing ideas for small business owners that you can easily implement and see results even from the first day! According to a recent research conducted by Aberdeen Group, Conversion rates are 6X higher (2.9%) for companies and brands using content marketing than those that aren’t (0,5%). Thus, this finding should not be neglected by small business owners. What would you say about "free" advertising? Hmm, who would say no? But the real question is how will you do that? But... of course with User-Generated Content. It is a current common practice your customers to indirectly advertise you by promoting your product/service to friends and colleagues in a way that does not look like advertising. Try to encourage your audience to behave that way, to transfer your ad to other people using various channels (e.g., Social media). This way your brand name gains considerable recognition. “User-generated content is a strategy that, if followed correctly, gives you unlimited ROIs because you do not invest a lot of money in it, "says Dave Allan. A great way to get started with User-generated content is to ask your audience to upload a photo while using your product or experiencing your service. When done right, UGC can offer numerous benefits to your brand. 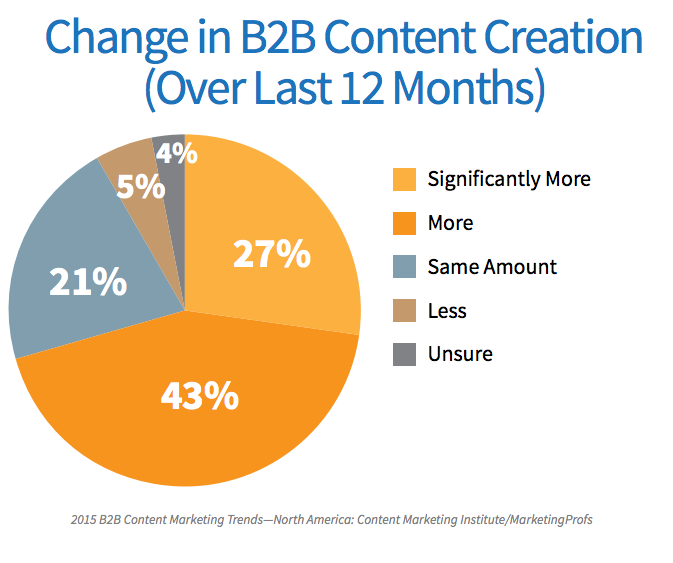 Therefore, it can be the most valuable content marketing idea, especially for small business. Don’t think of it twice… Explore the benefits of UGC right now! You won’t regret it once you see your conversion rates increase. BUT Be Careful: Take into consideration the new GDPR policy that takes effect in May 2018. Be transparent and clear regarding what you want your audience to do and how you use personal information shared by them. We are now in the era of videos and they are heavily being used for content marketing. If you are not riding this train already, hop to it. According to Aberdeen, marketers who use video grow revenue 49% faster than non-video users. On top of that, almost 52% of marketing professionals worldwide name video as the type of content with the best ROI (Adobe, 2015). 43% of people want to see more video content from marketers (HubSpot, 2016). Cisco also predicts that by the end of 2019 Internet traffic will be 80% from video viewing. As you understand, there is no reason for you as a marketer of a small business to diregard this trend. But the good news is that videos do not have to be of long duration. In fact, many times only small videos are needed to convey the message you want to the audience. Research has shown that small videos are more enjoyable to the user and offer greater conversion rates even from photos. Nearly 2/3 of consumers prefer video under 60 sec. At the same time, invest in newer video formats where you have a built-in audience such as Facebook Live Video. It has become a hot trend that you shouldn’t ignore. People spend more than 3X more time watching a Facebook Live video on average compared to a video that’s no longer live. This is because Facebook Live videos are more interesting in the moment than after the fact. One successful way to use video is for a step-by-step demonstration or unboxing. It’s impressive that 4 in 5 consumers believe that demo videos are helpful and facilitate the decision making process. Also, according to Google, almost 50% of internet users look for videos related to a product or service before buying. So, what are you waiting for? Ready for shooting! So, this is the official name of the pop ups that appear on various sites when the user moves the mouse out of the browser to change a tab or close your page. It's something quite new but already gaining popularity by big sites. This gives your users a second chance to sign up or follow any call to action you want to put. Measurements that have been made suggest that 10 to 15% of visitors you lose can be retained with this technique since are more likely to respond to a smart message before leaving your site. Because exit-intent popovers do not interrupt the user while they are on your site, so the users do not have the tendency to shut them down in order to continue browsing. One of the best known services in this segment is the Greek ExitBee! Who does not like playing Quiz? Ok, let’s not exaggerate! But it is true that many people enjoy the occasional quiz taking; just ask Buzzfeed. A quiz may be a very well hidden secret of content marketing, the perfect interactive content. According to Kapost, interactive content generates 2X more conversions than passive content. And it's not just that making it so appealing. Imagine using this awesome conversion rate to your brand’s advantage by making the quiz relevant to your product or service. Qzzr has measured that 75% of the people who start such a quiz tend to complete it, taking them 2 minutes and 27 seconds. Finally, many of those who do the quiz do share it and so you are automatically visibly to a broader audience. If you think about it, this is a great way for people to interact with your brand. Not at all, as Infographics are "liked" and shared on social media 3X more than any other type of content. So, why don’t you exploit this trend? Create an informational Infographic by using the data from a previous poll, survey, or data you’ve already collected and put it into a well-designed infographic. It's a low cost content marketing idea for small business you shouldn't ignore. This way, you will ignite readers’ attention as well as increase exposure of your content, resulting in more likes/shares and enhanced brand awareness. Also, it is important to keep pace with the latest trends and stats related to your industry, so as to turn them into a useful and digestible infographic for your audience. Don’t forget to encourage people to share it across the internet and social media channels. You can use Photoshop, but you also have at your disposal other tools, such as Piktochart. Use their templates to create an impressive infographic and then share it with your audience. Podcast listening grew 23% between 2015 and 2016. (Edison Research, 2016). We all are familiar with on-demand TV. Right? Now, on-demand is available in your radio. It’s obvious that podcasting has become popular among B2B marketers. Do you have any idea how to include it in your content marketing tools? Don’t worry if you don’t… I’m here for you! What would you say to interview successful podcasters, marketers, and experts in your industry? It sounds good as it offers you the chance to answer some of your audience questions. You can also host a separate Q&A podcast. Answer frequently asked questions, speak directly to your audience and build your image as a thought leader. Another way is to share a tip, tell a short story related to your company and products or record a lesson related to a hot topic, based on your customers’ preferences and needs. It’s also a good idea to turn some of your best blog posts into a Podcast. Your podcast doesn’t have to be long or a big production. You can start a short 10-15 minute and use basic equipment: a microphone and a recording device. Once you are done with your podcast, you can post the recordings to iTunes as a podcast or on your blog for readers to listen to or download. Research is a great resource for rich content creation ideas. But don’t forget to put your own mark on it, so that the content relates to your product/service and company. What will you learn from this new research? How the research can be applied to your industry? What surprised you, and therefore it’s worth sharing? What new ideas come up? These questions will help you recognize what seems interesting to your audience, and as a result you have the chance to increase your conversions. Bear in mind that, in order to grab your visitors’ attention, you should use the right call to action buttons and a relevant landing page to your website. Then, it is a matter of time to see the number of your subscribers rise! Not to mention that by creating your own research report you can establish yourself as a thought leader and an expert in your field. According to Demand Gen Report of 2016, 96% of B2B buyers want content with more input from industry thought leaders. So, take advantage of this unique opportunity and turn your leads into customers. Divide your report into small invaluable pieces of content and publish them across your channels. By doing this, you will bring more people to your website from different sources and then it’s up to you to convert them into your lifetime customers. Do you know how to stand out in a crowded digital world? What I’m trying to say is that you should create niche content instead of broad and generic. By doing this you diminish the probability of your content being easily forgotten and ignored. It's a content marketing idea for small business, that when done right, can lead to more conversions. According to Kapost survey, 70% of marketers admit that they are creating more or “significantly more” content than before. The content, published every minute, increases exponentially, meaning that you should invest in smaller, creative and in-depth content, in case you want to bring more people to your website and increase conversions. At the same time, a rewarding practice is to target a specific narrowed audience, which might be more interested in your content and business. For example, instead of content marketing focus on content marketing for small companies; it’s more specific and gets the attention of a relevant audience according to your product/service. What is your opinion about diplay ads? Hmm… You think they sometimes are intrusive and ineffective as people get used to and have found ways to block them. Yes, me too! But, what about native advertising? According to IAB, is expected to dominate the years to come. On one hand, publishers want a way to distribute their content, avoiding traditional revenue sources that considered being dead. A well-performing native ad is an almost low cost solution to increase traffic and brand awareness. On the other hand, consumers are 25% more likely to respond to native ads than dislay ads. Yahoo, also found that native ads lead to 3.6X boost in branded search vs. display ads. So, why don’t you invest in native advertising? TIP: For implementing native advertising successfully, you need high quality content. Otherwise, you won’t reap the benefits of such a tactic. Once you come up with valuable content, target it to your niche for maximizing results. Hmm, what would you say If you turn it into a presentation and post it to Slideshare? Because Slideshare is a new traffic generation platform owned by LinkedIn and is a successful way to build your brand and get more subscribers. Who could say no to such a platform that gets more than 70 million visitors a month and costs to him/her nothing? So, use Slideshare as a new medium for presenting your ideas in order to extend the life of your content and add more subscribers to your list. Using tools such as PowerPoint or Canva you can create beautiful slides that will attract people’s attention. The only thing you have to do next is to upload them to Slideshare. Try it! What comes to your mind when you hear the phrase “Behind the scenes”? Don’t worry… You don’t have to reveal any of your secrets or something that is very very personal. You know that to stand out in the digital world today you have to make your own mark. So, what I mean is that you have to create and share content that shows to your audience who you are. This way, you give people the chance to meet you from a close distance. Don’t forget that giving a face to your brick & mortal company will help you foster relationships and build trust with your customers. In a few words, show your personality and be more human, so that your customers can identify with you. show photos from exhibitions, conferences you took part in. A survey conducted by Orbit Media shows that more and more bloggers are using influencers in order to drive traffic to their posts; a trend that has steadily increased for 3 years in a row. According to a report by Nielsen, 92% of people trust recommendations from individuals -even if they don’t know them- over brands. People want more authentic stories and content that seems useful and helps them solve any problem they might have. They want someone else to speak about you, someone they trust and identify with. What you should learn from this? Leverage influencers… identify those with whom you share the same values and audience and use their power and authority to promote your brand, boost awareness and increase conversions. Collaborate with them and focus on building mutual win-win and long-term relationships. As every marketer does, track key metrics, such as reach, sales and brand awareness, in order to determine whether it’s worth “doing business” with the influencers you have chosen as your brand ambassadors. How do you feel when you receive an e-mail that uses your first name to welcome you? You might think it’s more personal, friendly and makes you feel that someone cares about you, as he/she knows your name. It’s all about personalization, a smart tactic, applied by marketers who want to start a conversation with you and stand out from competitors. Do you remember that time you visited a landing page and entered your name and email in order to download an eBook on content marketing? Since then, every time you visit the same website you are shown more books or topics related to content marketing. That is personalization, a way to show different content for different users based on their preferences and past behavior. Now, you might ask why I should invest in personalized content. Why not? It's a proven content marketing idea for a small business like you that can increase your conversions immediately. According to Crazyegg, personalized account-based marketing converts 4X higher than generic marketing. Also, based on a Monetate survey, 94% of digital professionals believed personalization was “critical to current and future success”. Therefore, marketers have increased their interest in personalization. Not only marketers want more personalized content marketing, but also your customers. According to a research from Invesp, 53% of online shoppers believe that personalization is valuable and up to 57% of shoppers are willing to give away their personal information in order to benefit from personalization. The key to apply successfully personalized content is to have as much data as possible for your customers. Then, you can craft super personalized messages. One way to collect data, such as their name, email etc. is to ask your visitors to share them in exchange for valuable content. Do you remember that ad following you across the web after you have visited a website? Oh yes, that is the so-called remarketing ad. It is notable that more and more marketers are spending enough money for remarketing. But why? Isn’t display supposed to be outdated and ineffective? Yes, but not remarketing, which came to the rescue. Remarketing is a proven way to increase conversion rates. The more a customer sees an ad the more conversion rates increase. In a few words, Remarketing helps you encourage people who’ve already been on your site to return and convert. Take into account that less than 2% of your website visitors will convert after they have been to your site; the rest of them will leave the page. According to Salesforce, it takes 6-8 touches for B2B marketers to generate a viable lead. Remarketing as a lead generation engine makes it easier, so it is an important tool for every B2B marketer. How can you set up a remarketing campaign? First of all, you need some customer data. For example, you should show a discount coupon/offer to people who click the ad but they didn’t buy anything from your site. Google Ad Remarketing: Google offers the opportunity to create remarketing ads using AdWords. All you need to do is add the remarketing tag to your website, build your ads, and set up your campaign. It doesn’t offer any Facebook retargeting options. Facebook remarketing: It comes to cover the gap that Google left. Therefore, the concept is similar to Google Remarketing and you can only retarget based on customer list, website traffic, app activity and engagement on Facebook. Final step: Show the right ads to the right people, so that you can improve the relevancy of your remarketing campaign, increase conversions and spend your budget wisely. Great! You now have an overview of the 14 most effective content marketing ideas for small business. But that’s just the tip of the iceberg. Don’t limit yourself only to the ideas mentioned above. Through trial and error you can come up with even more suggestions. The only thing you have to do is to figure out what excites and engages your audience most and… go for it! Don’t be afraid… There’s nothing holding you back. You have the information you need. Let’s the adventure begins! So, now it’s your turn… Which is your best performing content marketing idea?